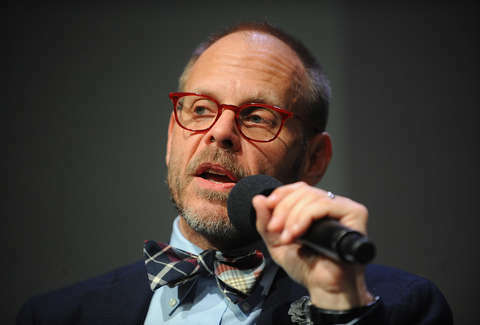 It was almost one year ago exactly that Alton Brown confirmed the return of his beloved show Good Eats. Since that time, it's been revealed that the "return" is complicated. There are actually two shows that will be coming out based on Good Eats. Return of the Eats, a new show based on the original, is expected to premiere on the Food Network in 2019. (Brown re-confirmed that timeline in the comments of the post below.) Earlier this year, Brown revealed he was doing some kind of remix of old Good Eats episodes. Though, it wasn't entirely clear what remixing a cooking show would entail. In a Facebook post on Monday, Brown clarified details surrounding the latter of the two shows. "I'm revisiting the Good Eats library and renovating some classic episodes," Brown wrote, "by adding new scenes, new science, and new recipes. The result: Good Eats: Reloaded." So, the first "return" of Good Eats isn't exactly a new show, but updated versions of the original show, which is more than welcome. Good Eats was a fascinating show at its best, but some thinking on food and the science around it has certainly changed since the show first debuted back in 1999. The revamped version of the seminal show will premiere on the Cooking Channel on October 15 at 9pm ET. Brown hasn't yet revealed which episodes will be getting a makeover, but let's hope one of them is "Pantry Raid: Cool Beans" because that episode was totally cool beans.